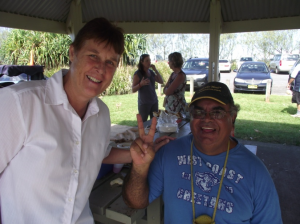 This month you’re invited to read about Sr Kathryn’s Aboriginal Ministry. The Aboriginal Catholic Ministry (ACM) tentatively began in the Diocese of Lismore at Bowraville with the arrival of Fr Bernie Ryan sm around 1990, the same time that three aboriginal children in Bowraville were murdered, a case that is still unresolved. Some years later (1995) the ACM was formalised as an Inter Provincial project consisting of a team of Marist Fathers, a Mercy Sister and a Christian Brother based in the Southern part of the Diocese. In 2001 I was appointed to this team. For six months during my discernment time, I was exploring where there was a need. Aunty Ponnie (Yvonne del Signore) a Bundjalung Catholic elder invited me to Ballina to meet the local community. It was Aunty Ponnie who suggested that I come and be with the Catholic mob in the Ballina area and surrounds as they really didn’t have anyone ministering to them in the Northern part of the Diocese. Since that time I have been doing a dual ministry of Aboriginal and Parish Pastoral Associate in St Francis Xavier Parish, Ballina. During this time Aunty Ponnie has been mentor and friend guiding me in the cultural ways of the Bundjalung people. Aunty Ponnie was the conduit for me and the local community. Sad to say Aunty Ponnie died last year. Ministry is blessed with chaos and drama. I try to bring some order and calm to situations as they arise e.g. being with the families and individuals in their vulnerability and fragility particularly in times of grief and tragedies. On the other hand there are wonderful times of ‘get togethers’ for special occasions such as NAIDOC Week and other family celebrations. 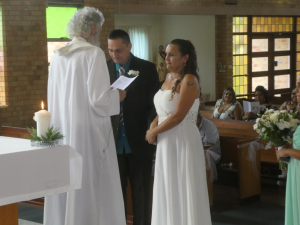 Just recently the parish celebrated its first Aboriginal Catholic wedding, a joyous and treasured memory for all concerned. There was change to the ACM two years ago when the Marist Fathers withdrew from the Diocese leaving a big hole in the ministry. Prior to their departure Aboriginal Masses were held once a month in each region. Baptisms and Funerals were included in the ministry. With that departure the ACM is left with only myself in the Northern part of the Diocese and Br Steve Morelli cfc in the Southern part of the Diocese. Part of Steve’s ministry is working in linguistics and enabling Aboriginal languages to be accessible. Preparation for Sacraments of Confirmation and Holy Communion are done through the St Francis Xavier Parish. The personal approach that I use is another means of contact with the families and a way of knowing that the children are prepared to celebrate the particular Sacrament. My ministry is one of privilege and trust as I develop and continue to build meaningful relationships within the community. The Aboriginal people feel free to drop into the parish office when in need or to get help. My pastoral role in the parish has allowed this connection to evolve. Over the years I have witnessed a real growth within the Aboriginal community; there are more students completing Year 12 and accessing tertiary education than in earlier years. The employment level within the area has greatly improved. It is with gratitude and joy that I continue this ministry with the Aboriginal Community in the northern part of the Diocese of Lismore. Images provided by Sr Kathryn Sweeney. Used with permission.